Home / Travel and Living / Pitchavaram mangrove forest and beach boat ride- is it worth? Pitchavaram mangrove forest and beach boat ride- is it worth? Recently we went to Pichavaram for the 3rd time.During last two visits we didn't go to beach. [First visit details here] We had opted for cheaper boat rides which entitled us for a ride inside the mangrove forest. This time, I thought of checking out the beach visit, which takes twice the time and costs twice as much. Above: Pichavaram boat ride options and fees. 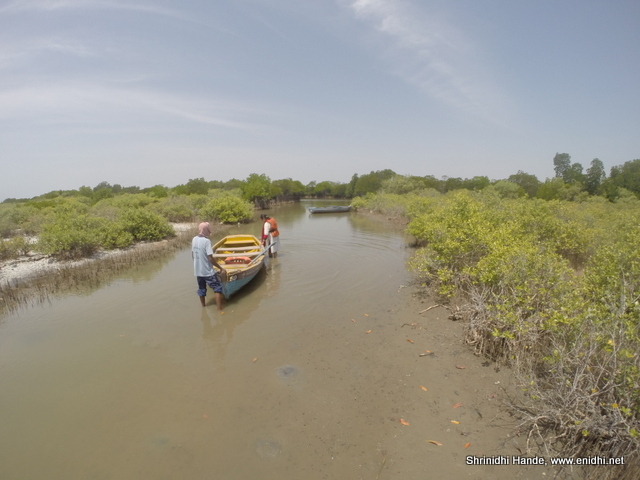 2KM row boat takes 90% of time in open water, with one super short ride inside mangrove forest. Boat fellow asks for extra money (200-300 rupees to go for another round inside the mangrove forest. Speed boat I have not tried, but it takes less time in open water to reach the forest hence you can expect more time inside the forest. But big boat can't go into narrow canals, so your experience might be limited. The 6KM ride is what gives maximum exposure, but feels expensive unless you're a group of 4-5 people. We tried the row boat 6km ride this time. After coming back from the beach visit, I feel it is not worth going there. This post shares my observations about Pichavaram beach visit and some tips to select right boating option. What is there at Pichavaram beach? A 4 hour boat ride entitles you to spend some time at the Pichavaram beach. At the beach there isn't much to see. 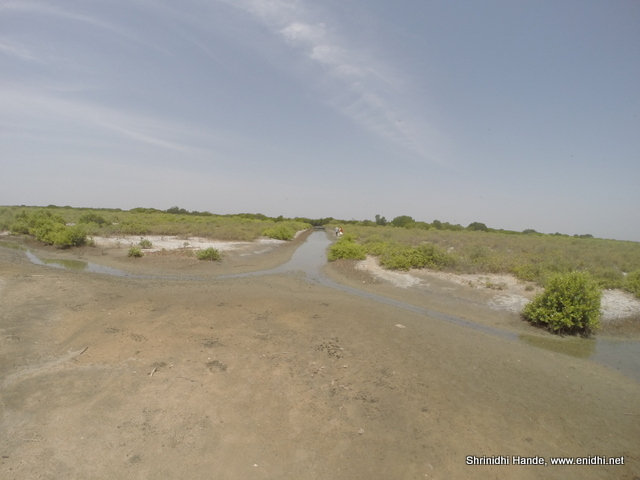 You can see sea water and backwaters merging (if you can walk a lot), there're a few dried up coconut trees, bushes and of course the untouched beach. 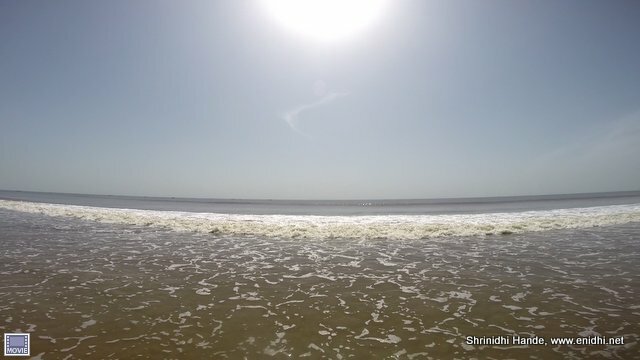 While beach is shallow and clean, going all the way there by paying Rs 1100+ for boat ride, during hot sun, just to spend about 30 minutes is not at all worth. You can find similar beaches all around ECR. 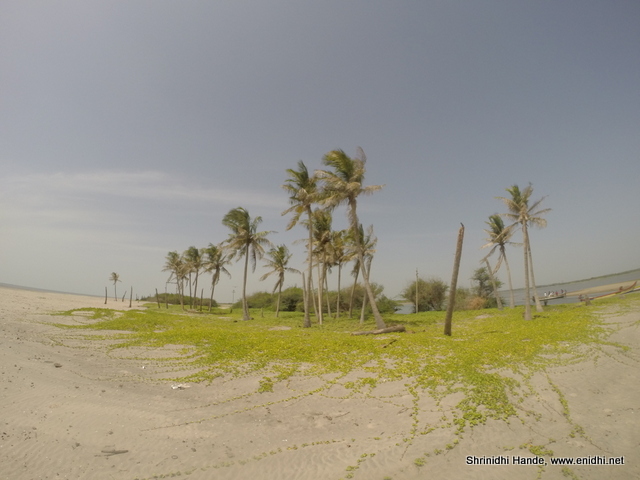 This particular Pichavaram beach would have been ideal place to spend an evening, but boat timings are from 8 AM to 5PM (last departure for beach visit is at about 1 PM) only, which means only time to go there is day time, when sun is very hot. There're no resting places and no refreshments available. Facilitating some overnight camping around here would have been great experience for tourists. Also we were told there was a village here, which got wiped out in 2006 Tsunami. Around 160 odd people either died or had to abandon the village. Remains of the electrical poles are there even now to tell the tales. Coast guard Dornier aircraft that went missing is believed to be found near Pichavaram. Our boatman said he saw the debris. We had opted for row boat, which is very slow. 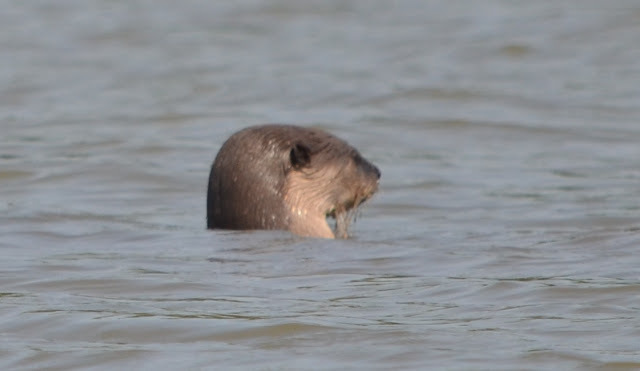 So more than 70 minutes is spent in going to the beach in open waters, we get about 30-40 minutes to roam around, another 70-80 minutes to come back. In between a short 10 minute ride inside the canopy (ride under the mangrove) is included. An alternate option is speed boat, which costs twice as much as row boat, but saves on time. But Speed boat can not go into narrow passages inside mangrove forest. The best bet: An alternate way is to book for 4 hours, but tell the boatman NOT to go to beach but spend maximum time inside the mangrove forest only. This is not listed as one of the options while booking boat ride- but can be had through prior discussion with booking staff and boatsman. Pichavaram is about 250 kms from Chennai. If you start by 4 AM, you can reach there by 8.30AM and enjoy an early morning boat ride before sun heats up. Basic facilities, including accommodation and food are available, but it is better to keep either Cuddalore and Chidambaram as base in case you're planning to stay or for meals etc. Looks interesting, but for the beach. Interesting analysis and if I ever go there I would take that last option you gave - 4 hours row boat ride but only to mangrove! True. Got that idea only while returning. Should try next time. Thanks Shrinidhi for a nice write up. I was planning to go here some time this year and now i have to think about it. I did only the mangrove trip. Great place but less tourism there. It should be highlighted more. Is any hotel near by to stay a night near by?? Hi your article was very nice. can you please share something about safety and security? is it safe to go with family? Hi, We are going in may (summer) as a side trip from chidambaram. Is it worth it or will it be too hot to enjoy anything? Like will it be all dried up? what is the worst and best scenarios? please please suggest! Yes. The place is operational only during day time and there will be other tourists- so perfectly safe.